There’s no doubt about it: The life of a (successful) freelancer sounds like a dream come true: you can do what you want, when you want and work from wherever you want, even your own bed. However, to be your own boss and only colleague, can also be a lonely affair — you’re all alone with your thoughts, ideas and decision makings. You have to be your own decision maker, manager and motivator, and you have to find and close every deal on your own. But if you’re a freelancer you’ve already decided that you can do it — you’ve got the talent, you’ve got the ambitions and you’ve got the guts to make it! You’re going to take over the world! Just imagine what you could do if there were ten of you. Art collectives have been around for ages, and as the world opens its eyes to the unmistakable value and allure of the model, we see it spread out through every industry - especially in the world of creativity. Likeminded creatives with common dreams and ambitions uniting under a collective, where the ultimate goal is simple: to help each other out. KOSO Collective was founded on the very same reason. 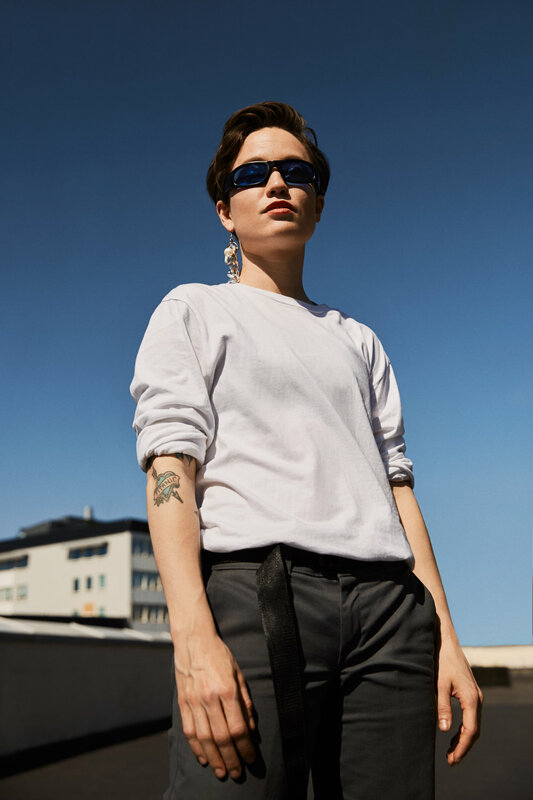 It was when psychologist student and DJ Marit Soldal and musician Juno Jensen was working together at the local student radio, that the idea sparked. –We realized we had a lot in common, and that we both had a lot of skilled friends who were working on a various of different creative projects, says Marit Soldal. – However, we saw that it could be difficult for each creative to stand out in the crowd. And as if it wasn’t hard enough for their friends to make it on their own, there were also the fact that women have been largely underrepresented in several parts of the music industry. Marit and Juno wanted a change. –So we created KOSO, with the idea of creating a network of women who would back each other across different fields of the creative industry. This was back in 2013. Today KOSO consists of DJ and booking agent Marit Soldal (Soldal), musician and producer Juno Jensen (Pieces of Juno), DJ, producer and booking agent Svanhild Landvik (SVANI), VJ and visual artist Anna Leijonhjelm, photographer and musician Sara Angelica Spilling, dance Ida Frømyr Borgen, musician Sigrun Sæbø Aaland (HYSJ), musician Anniken Jess Iversen (ANANA), musician and rapper Stine Wingsternes (lilleStine), mix and mastering engineer Lillia Betz, illustrator Victoria Ulrikke Iles, videographers Kristine Meling Enoksen and Liv Mari Mortensen, writer and photographer Kristine Helliesen, type designer Robin Mientjes, production designer Hedda Eddy Virik and stylist Juliette Aleksine Piiksi. Quite impressive, right? Each one of them has a strong and unique style and presence. Meet them all at once, and you won’t be able to escape their energy. –something that would reach beyond national borders. We wanted to have our own office space, our own studio, our own store. We even wanted to make our own wine. Even though their plan of having a studio in every big city and their very own airline didn’t come to life (yet), they did start their own online culture magazine which eventually became a meeting point for many women. They also started hosting club nights, where all the girls came together and practiced their DJ skills and just had fun. It was here photographer Sara met Juno and discovered her own musician within. —we understand each other and we’re a perfect match creatively. She encouraged me to develop as a musician, produced some of my sketches, and eventually we started a label and released the music. The club nights continued to be an important part of the collective, and Marit and Svanhild now run KOSO CLUB under the names Soldal and SVANI. Their ambition is to promote a more diverse and open club culture in Oslo, and their strong presence helps draw outsiders in to the KOSO universe. This summer they are even booked to several large festivals. –In a way I think we are the scruffy sister of KOSO. The one who loves playing loud music, partying and staying up late, says Marit. KOSO is definitely a diverse group of women, each stronger and more independent than the other. But even though they’re different, they all see the value in promoting each other and working together towards common goals. And as the group consists mostly of women, they are often politicized, a responsibility they take very seriously. –Women have been, and continue to be underrepresented at concert stages, at the clubs and especially in producer roles. KOSO has acted as a platform and safe space for creative development and exchanging of ideas, and we have been able to highlight these issues. The lack of female bookers, DJs and producers gives KOSO a second incentive — not only are they to promote and help each other be the best they can, they are also battling the industry for more equality and visibility. Only 5% of the producers in the world are female, a number KOSO believes can change with more visible and strong role models. –It’s important that the women who want to be in music production receive the space and support to do so, without prejudice, sexism or discrimination. This is a joint responsibility, says Sigrun, singer at HYSJ. She and her band mate Kim Mikal Torp are ready to take the music career to a more serious level and is facing a year filled with new releases. –KOSO has been a major help for us, she says, –there’s great value in being able to ask for advice and help. –At times when I haven’t been confident in myself, I have found that it only takes one person to turn things around and motivate me, says Sara Angelica. –I feel fortunate to be around so many kind, talented and productive women. It’s empowering. In their presence you can’t help but feel it too. It’s as if they are of a different breed, these women. You see them walking the streets of Oslo, illustrating the articles you read, photographing the people you admire, howling into microphones at local bars, playing in dirty cellars. Constantly delivering top shelf creative services on a broad spectre of disciplines—an unmistakable aura of something unique has claimed its presence.